Daimler opened its first Mercedes passenger-car engine plant outside of Germany in Beijing last year with China partner BAIC Motor. FRANKFURT (Reuters) -- Battling to catch up with luxury rivals in China, Daimler is shifting gears, giving local authorities unprecedented access to new Mercedes-Benz models and even tailoring German-made engines to Chinese regulations. For years, Daimler has lagged Audi and BMW in the world's biggest car market. Last year, Mercedes sold 228,000 cars there, compared with nearly 492,000 for Audi and more than 362,000 for BMW. For years, Daimler had doubts over the sustainability of growth in China. German labor union resistance to shifting production out of Daimler's main factory in Sindelfingen, near Stuttgart, also played a role. Another key factor has been Daimler's more cautious approach to sharing technological know-how due to fears of piracy. This prevented the company from deepening its footprint in China, where foreign automakers are required to work with local companies, at a time when its rivals were going all-in. to closer cooperation if they are to make up lost ground in a market that continues to post impressive growth rates. This year, Daimler is starting production of its new-generation C class in China as well as Germany, a step-change for a manufacturer that had previously delayed local Chinese production of new models by months. Beijing Benz Automotive Co. (BBAC), the joint venture company Daimler runs with Chinese partner Beijing Automotive Group Co., is also constructing a new production line for the GLA compact. To get permission to build both cars locally, the models must undergo a 160,000km emission durability test and a regulation test with Chinese authorities. These can take up to a year. "To put it bluntly, we are transferring know-how," said Rene Reif, head of engineering and manufacturing at Beijing Benz. Today, Mercedes GLA prototypes are parked at a brand new research and development center built for BBAC. And a new C class, code-named V205 is propped up on vibrating pillars to undergo final "bust squeeze and rattle" testing before its looming launch in China. Frank Deiss, president and CEO of the Beijing Benz joint venture, says the Chinese-made cars will have the same build quality as a Mercedes assembled in Bremen or Rastatt, Germany. To tap China's potential more effectively, Daimler recently moved its Mercedes-Benz Advanced Design Centre from Japan to Beijing. Its main research and development activities for Mercedes remain in Germany, but China's influence is increasing, even on Daimler's home turf. For example, the AMG GT, a high-performance sports coupe being developed in Affalterbach, Germany, is having its engine size reduced to avoid China's progressive taxation thresholds. "The GT was developed in part with the new tax in mind," AMG CEO Tobias Moers said, explaining that the car will have an eight-cylinder engine with a capacity of just below 4.0 liters because of the Chinese tax. Daimler only started making Mercedes cars in China in 2006, reaching production capacity of 120,000 vehicles last year. Audi, which has been making cars there since 1988, surpassed that level in 2007. If demand continues to rise, Daimler says the capacity of its Beijing factory can be ramped up to make 350,000 cars. Asia remains the key battleground in Daimler's fight to reclaim the crown of the top-selling maker of luxury cars in the world. The last time Mercedes held the title was in 2004. For all three premium manufacturers, the biggest growth came from China. Mercedes saw China sales jump 27 percent last year, BMW rose 19 percent and Audi 21 percent. Daimler says Chinese clients want top-of-the range models and that this is the main way for Mercedes to increase its market share in China, which stands at about 1.5 percent, compared with about 5 percent in Europe or more than 15 percent in Singapore and Hong Kong. Daimler is counting on China to outgrow western Europe, North America, and Japan because the Chinese market still has fewer than 74 cars per 1,000 inhabitants compared with 562 in Germany and 742 cars per 1000 inhabitants in the United States. The pace of Daimler's expansion ambitions has led the company to train Chinese staff using the German model of vocational training and send China-based staff to Germany to acquire specialist skills. 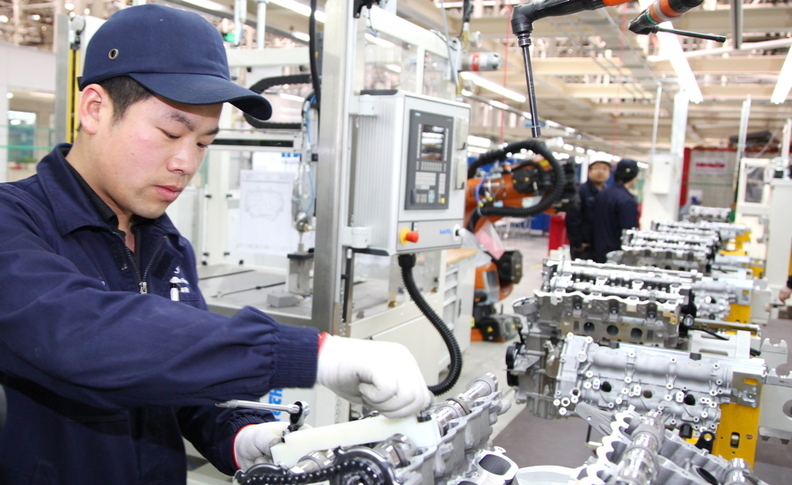 In 2012, about 100 Chinese high-potential employees received training on how to build engines at the Daimler factory in Untertuerkheim, Germany. Daimler is also opening a training center for dealership staff. Wang Lingyu, a general manager for vehicle quality at Beijing Benz, said that apart from taking part in weekly conference calls with Daimler's German factories, she makes regular trips there too. With rip-offs less likely to be tolerated, Daimler is stepping on the gas in China, even with its most cutting-edge technologies. "Innovations that are introduced late," Weber said, "are of no use."